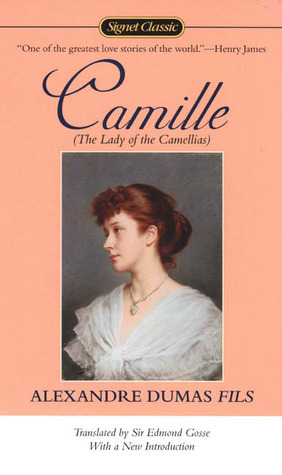 Camille by Alexandre Dumas, fils. I am going to go see the ballet based off of this book in a couple of weeks, so I definitely want to read the book. But then I found out that it's the book that Moulin Rouge is based off of, so I HAD to have it, right? Right! I've started reading it and am thoroughly enjoying it so far, though I am just in the setting the stage part of the book. I can't wait to get to the meat. 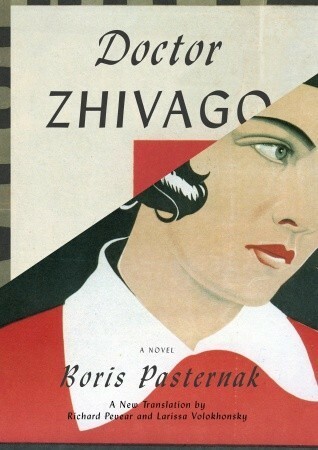 I also bought a copy of Doctor Zhivago by Boris Pasternak. I had heard of the movie for quite some time. Then I became familiar with the book. It appeared on the classics reading list I chose for myself at my personal blog. Then I found out it was considered to be a love story. As a result, it's been higher up on my list for a while, so when I was sneaking books, I tossed it in. I think I'll take this with me when my papa has surgery in a few days. Lastly, I sneaked in a copy of Americans in Paris: A Literary Anthology, edited by Adam Gopnik. I am one of the few francophiles I know. Most everyone is an anglophile. I dare to be different. I have nothing against anglos and anglophiles, but I just relate more to the French way of life. Anyway, this is a really interesting book, in my opinion. It looks at various Americans writing about France. We start with letters from the Founding Fathers, like Franklin, Jefferson, and Adams and go through the years with excerpts from works by Twain, Heminway, Fitzgerald, and Kerouac, as well as continuing to have non-fiction writings by the likes of Faulkner and Charles Lindbergh. I think this will be a nice companion to David McCullough's The Greater Journey: Americans in Paris, which only covers the years 1830-1900, but still, I like pairings. Taken by Erin Bowman: ZOMG so excited! This was on my most anticipated debuts of 2013 list! Dead Silence by Kimberly Derting: I LOVE THIS SERIES! Simultaneously so excited and so frightened to read this last book! Fragments by Dan Wells: I have yet to read Partials but have it on my shelf so I'm very curious! Arclight by Josin L. McQuien: Never had heard of this one honestly but you know I'm a sucker for a dystopian/science fiction novel! The Shadow Girl by Jennifer Archer: This sounds super cool and creepy! Timekeeper by Alexandra Monir: I haven't read Timeless! Is this something I'd enjoy, friends? 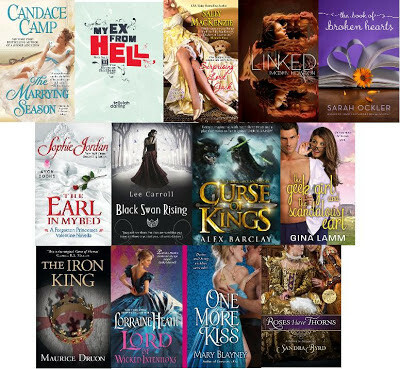 The Rogue's Princess by Eve Edwards: I have all of these books because I love historical fiction but I've yet to read them! Siege & Storm by Leigh Bardugo: I have Shadow & Bone waiting for me so good thing this came as a surprise! Crash & Clash by Nicole Williams: Hmmmm. New Adult. Hmmmm. I was really excited about the genre but most of what I'm hearing is stuff I wouldn't like. But I guess it's time for me to make my own opinion. These sound interesting enough to me! Code Name Verity by Elizabeth Wein: Because everyone and their mother told me to. And for book club. Reading it now and it took a bit to get into but definitely picking up! The Longest Way Home by Andrew McCarthy: You know I love the travelogues. Sadly, I didn't purchase any books this weeks because I've been ill with the plague. But next week I'll be buying ALL OF THE GAYLE FORMAN NOVELS because she is coming to town and that makes me want to keysmash and hula hoop and do the robot. -The Marrying Season by Candace Camp: I LOVE historical romances where they believe their marriage to be of convenience and have a passionate love instead! -My Ex From Hell by Tellulah Darling: YES GREEK MYTHOLOGY! -Linked by Imogen Howson: ALL THE EXCITEMENT! Isn't the cover gorgeous? -The Book of Broken Hearts by Sarah Ockler: I've been meaning to read one of Sarah Ockler's books, cause I've heard amazing things about them! -The Earl in my Bed by Sophie Jordan: I LOVE Sophie Jordan's historical romance, so of course I need to read this novella! -Black Swan Rising by Lee Carroll: sounds creepy! -A Curse of Kings by Alex Barclay: it sounds like the beginning of an epic new fantasy series, of course I'm IN! -The Geek Girl and the Scandalous Earl by Gina Lamm: ok, so this has the potential to be either AMAZING or the cheesiest of chees, I'm hoping for the first. -The Iron King by Maurice Druon: first published in 1955 and full of court intrigue, yay! -Lord of Wicked Intentions by Lorraine Heath: I really enjoyed the second book in this series and the novella! 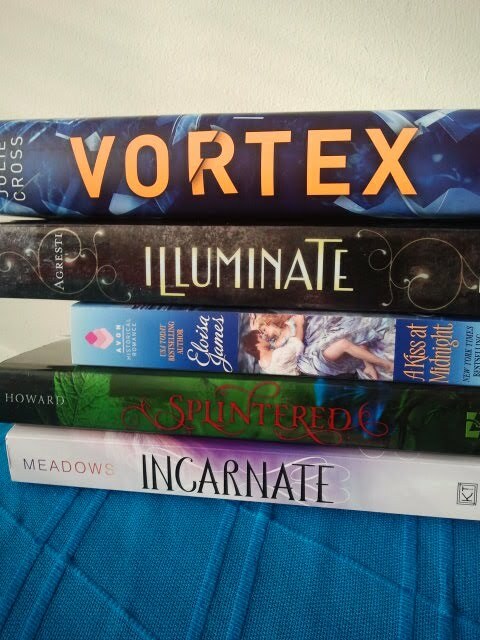 -Vortex by Julie Cross: I really enjoyed Tempest and am really excited to find out what happens next! -Splintered by A.G. Howard: SO EXCITED! The cover is stunning! I read Partials over the holidays and it's good to know there's not too long until the next one is out. I enjoyed it more than I expected. Lori- I just added Americans in Paris to my wish list- looks really good. Great choices! Glad to introduce you to a new book. Ok another one with Crash and Clash. I need to look these up haha! I hope you enjoy your awesome haul of books! Everyone got such great hauls! So excited for Siege and Storm! And I got The Geek Girl and the Scandalous Earl, it sounds hilarious haha. You all got really great hauls - jealous! Crash and Clash are both really high on my TBR list, so I'm looking forward to see what you think about them. JAMIE- Taken AND Fragments are BOTH on my MOST anticipated list for 2013! I can't wait for them and am VERY jealous girlie! WOOT! WOOT! I can't wait to see what you think of them! Very cool beans! I have Shadow & Bone waiting for me on my shelves still too; I guess I better get to it if the next one is coming soon! And DAISY- SPLINTERED is AWESOME! Holy moly is it AWESOME! I LOVED that one! Happy reading! Yay!! I'm reading it next :D So glad you enjoyed it! Jamie: YES CODE NAME VERITY! I cried so hard! Also, I'm slightly jealous of you for getting Siege and Storm, Shadow and Bone was one of my favourite reads of 2012 :) Hope you enjoy it! So many amazing books! I am so excited for Dead Silence, I love that series :-) Splintered was great & I wasn't a huge fan of Crash. Happy reading! I hope you enjoy your new books. Amazing hauls this week! I'm super excited for the release of Arclight. It sounds so amazing and the cover is gorgeous. It's definitely one of my anticipated reads for this year. I hope you enjoy everything! You guys have such a great haul this week, I'm definitely jealous! Check out my IMM/ STS! Wow, such a nice haul. You guys are so lucky, you got some awesome books this week. I'm jealous, I want Timekeeper too! Timeless was AMAZING! Happy reading, I hope you guys enjoy your books! Hope you love Splintered! The cover is definitely amazing and it's a really great book.